Larry Krasner has spent his professional life defending activists and suing the police. EDITOR’S NOTE: On May 16, Larry Krasner won the Democratic primary for Philadelphia district attorney, sweeping past the six other candidates in the crowded field to earn more than 38 percent of the vote. As news of his victory spread, progressives and criminal justice activists broke out the champagne to celebrate a triumph that had seemed unfathomable just a few months ago. "This wasn't just a primary victory. This was a revolution," proclaimed Philadelphia Daily News columnist Will Bunch in an ecstatic dispatch published the morning after the election. Next up, Krasner will face off against Beth Grossman, the presumed Republican candidate, in the November general election. Ending mass incarceration begins at home, says Larry Krasner, a longtime civil-rights attorney and leading candidate for Philadelphia district attorney. Harsh sentencing laws passed by Congress and state legislatures set the stage for mass incarceration, and police make arrests on the streets. But it is prosecutors who decide whom to charge, what to charge them with, and, in a system that often resolves cases with guilty pleas, what sentences to seek. In Washington, Donald Trump and Attorney General Jeff Sessions are endeavoring to resuscitate an embattled war on crime, criticizing states that have legalized recreational marijuana, falsely claiming that immigrants pose a criminal threat, and moving to pursue harsh mandatory minimum sentences for drug offenders with abandon. But in reality the federal government incarcerates a small fraction of this country’s enormous prison population. States incarcerate an estimated 1,330,000, compared to 197,000 in federal prisons. An estimated 630,000 more sit in local jails on any given day, often held pretrial because they cannot afford to pay cash bail. In Pennsylvania, there were 49,916 incarcerated in state prisons as of April 30, 28 percent of them hailing from Philadelphia. The Philadelphia Prison System, the local jail, currently holds roughly 6,600 adults. 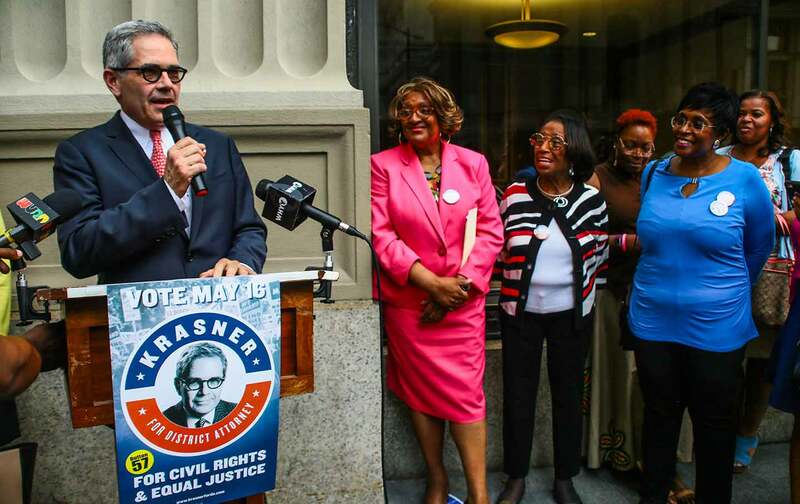 Krasner, one of seven candidates in a tossup race for the May 16 Democratic primary, would not make for a typical district attorney. In fact, it is an office that he has spent his entire career fighting, going after abusive and lying cops, and representing protesters from Black Lives Matter, Occupy Philly, and ACT UP. In recent years, criminal justice–reform candidates have won races in other cities. But Krasner may be the first running a major campaign so explicitly aligned with social movements and so vociferously opposed to mass incarceration. He plans to reduce the city’s jail population by eliminating cash bail and by diverting low-level offenders away from incarceration entirely. But saving significant funds that can be reinvested into public education and other services, as he would like to see happen, will require a significant decline in the prisoner population—steep enough to cut costs attached to paying for prison guards and facilities. Violent crime remains a third rail for reformers, and any effort to shorten sentences for people convicted of violent crimes—offenders who make up a large part of the state prison population—could stoke controversy even in a more progressive political climate. And, critically, his election may prompt the cops and prosecutors with whom he would work into open revolt. John McNesby, president of Fraternal Order of Police Lodge #5, described the very prospect of Krasner’s candidacy as “hilarious.” There’s no love lost. When the FOP endorsed an opponent in the race, former city managing director Rich Negrin, Krasner called both “authoritarian,” and said that the move was no surprise given that the union had endorsed Trump. But what would have been a marginal protest candidacy just a few years back now has a serious shot. That’s thanks to a grassroots mobilization underway, and also to Philadelphia Justice and Public Safety, a political-action committee backing Krasner that has received a reported $1.45 million from liberal financier George Soros. Remarkably, Krasner has not received much in the way of soft-on-crime attacks—a message that once would have resonated in a city where gun violence persists in heavily segregated and deeply impoverished black neighborhoods. It’s hard to overstate the brokenness of Philadelphia’s criminal-justice system. In March, District Attorney Seth Williams was indicted on federal fraud charges after allegedly taking gifts in exchange for promised favors. Additional charges were filed this week. But The Philadelphia Inquirer, which often reports on criminal justice as though it’s a political beat, has for years missed the bigger story on Williams: He ran as a reformer but has fought reform at most every turn. He long failed to staff his own Conviction Review Unit, fought the Pennsylvania Innocence Project in court, resisted marijuana decriminalization, put cops on the stand who then committed perjury, and ran a massive civil asset–forfeiture program. There is no public polling for the race. But Krasner is considered a front-runner, drawing support from a multiracial coalition of activists as well from influential black powerbrokers. His campaign, like that of current Mayor Jim Kenney, will require scrambling the racial math that for years was thought to govern city elections. Krasner, like Kenney, is white, but has a record and platform that is attractive to the communities most devastated by mass incarceration. Daniel DenvirDaniel Denvir is a fellow at Harvard Law School's Fair Punishment Project and the host of The Dig, a podcast from Jacobin magazine.